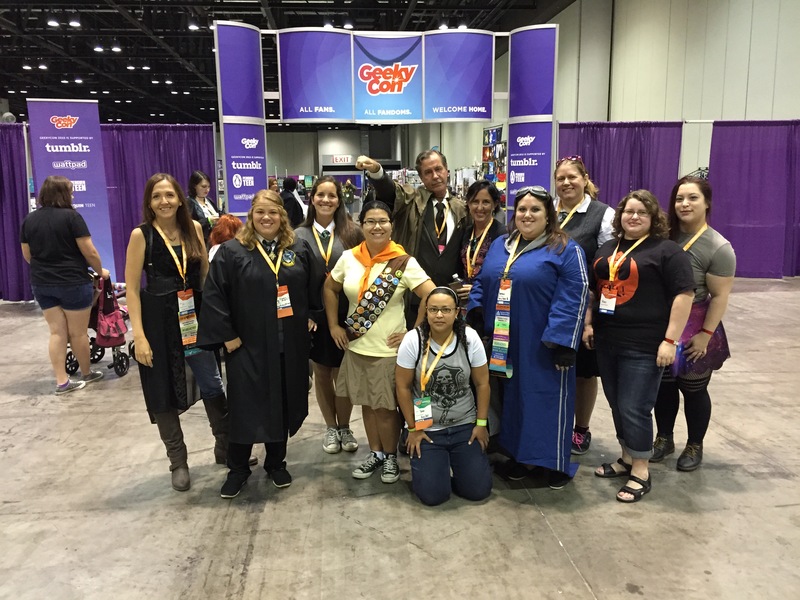 August 12, 2015 August 19, 2015 Melissa P.
GeekyCon is a fan convention where you can celebrate the fandoms while you “get your geek on” with fellow fans. What makes this event different from other nerd/geek conventions is that GeekyCon is focused on acceptance and positivity. The attendees really embrace that. The attendance was much smaller this year, probably due to it being the first year after a complete re-branding. In previous years, it was called LeakyCon, a convention with roots in the Harry Potter fandom. The original convention organizers ran the well-known Harry Potter fan site “The Leaky Cauldron.” The convention split off into two conventions: LeakyCon, which is now a smaller con with a focus solely on Harry Potter (reportedly being held in CA in fall 2016), and GeekyCon, which will now include all fandoms. It didn’t seem much different than the year before; Harry Potter was still a strong presence and the uniting factor for the attendees. The con is sometimes jokingly referred to as “RibbonCon” by its attendees because of the badge labels that are traded and given out. 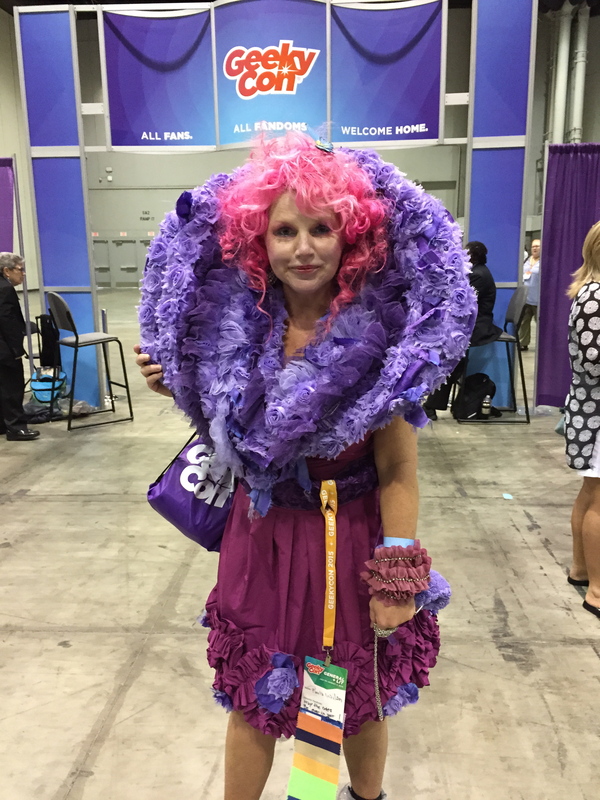 Everywhere you turn, people have ribbons dragging to the floor or looped over and secured to their lanyard. 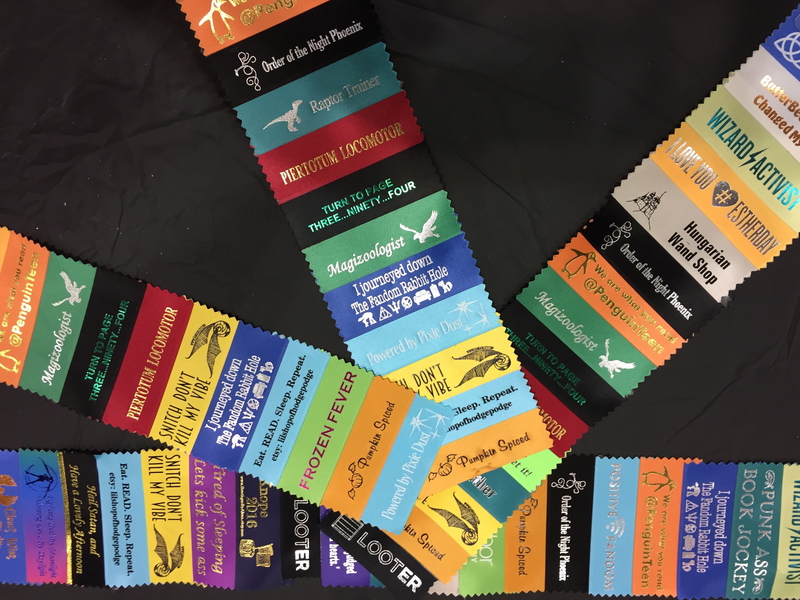 It is easy to get caught up in the excitement of getting more ribbons, especially when you see one for your favorite fandom. I had trouble walking by the end of Saturday because the stream of ribbons kept getting in the way. While not a huge cosplay con like MegaCon, you still get a good amount of people dressed up. There was even a cosplayer dressed up as the Hogwarts Express Trolley Lady from Harry Potter and was giving out free candy. 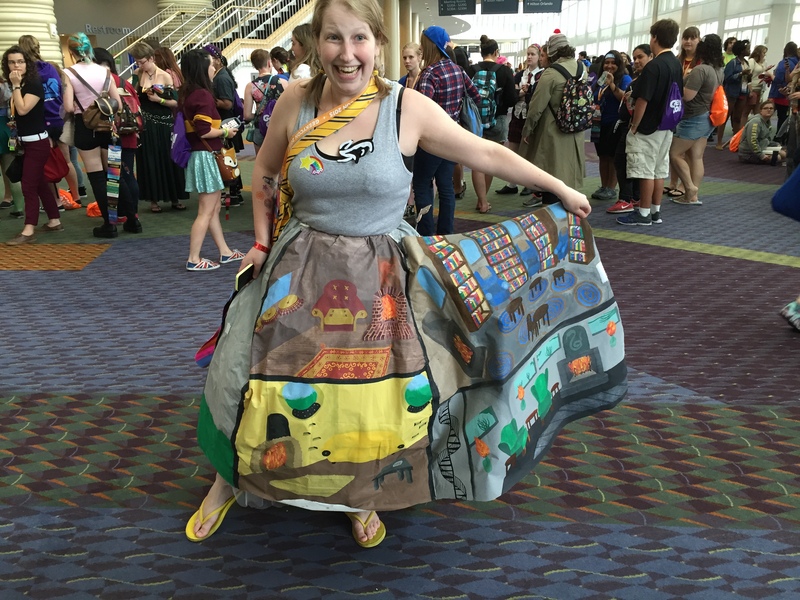 The picture below is of Hogwarts Castle – her skirt opened up to show the house common rooms that she hand-painted. How cool is that?! GeekyCon had some great freebies. Penguin Teen hosted a lounge with some comfortable couches for reading or socializing, LOTS of free book samples, plus their representatives suggested a book based on your favorites that you could take home for free! The Loot Crate booth had a ton of free geeky swag such as a Game of Thrones jump drives and The Princess Bride playing cards. Thanks, Loot Crate!! They also had lots of fun interactive things to do at the convention, like a wand dueling panel, sing-alongs and even an escape room game “Geek Escape”, an escape room with a geeky twist. I was really excited to do this; I have done an escape room before and it was tons of fun! Let me say the game had some problems but it was still fun. Here are some of the issues I had with the game. Fifteen people (especially 15 people you have never met before, most wearing cosplay) is way too many to be in one game. It was a small room… and all our bags and cosplay accessories were all in that same room. People were talking over each other. You couldn’t even fit around the table to see the clues at the same time. There simply wasn’t enough room. I wouldn’t do any more than eight people. It was dark. They had turned the lights off, maybe to make it more difficult? They needed a room with a dimmer switch; the lights being off was way too dark. They only gave you 35 minutes. I think the game needed at least 45 minutes for the amount of puzzles and clues they had. The first 25 minutes of the hour allotted were taken waiting for the leader and then him giving us the rules. We didn’t finish. And the person leading the group said only one other group had completed the challenge. That should tip them off that the game needed a little more time. The thing about the escape room games is you want people to win. You want them to almost run out of time so that you get their adrenaline pumping and finish with only seconds left. This way they can cheer and feel accomplished and then go away telling all their friends how fun it is. I haven’t heard any friends that have played real escape rooms say they didn’t complete it. 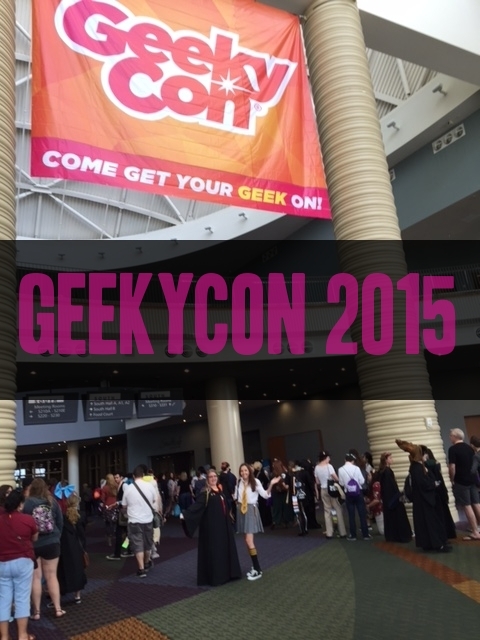 I also haven’t heard anyone else talking about the GeekyCon Escape Room. So the reason we didn’t win was because of a piece of equipment called a Cryptex. 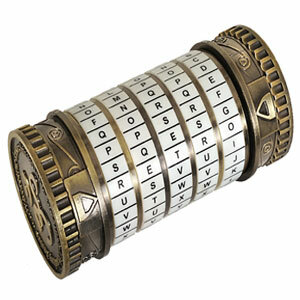 I have never used a Cryptex before and doubt anyone else in there had, but basically you turn the letters to the correct code and pull it open. The clue was a summoning spell, so of course we all thought it was Accio. We had about 8 people try Accio, multiple times, and other words on this device and it would not open. We spent about 5 minutes on this and it opened finally with 30 seconds left. Not enough time to use what was inside to get the final clue. The leader comes out and says, “I told you that the Cryptex sticks and you have to wiggle it to get it to open.” WTF!? You think I remember that when you gave us like 25 rules in the beginning. Mind you, you also get two hints from him that you can use, but everyone has to agree to use them. Those hints aren’t helpful at all, just more clues that make it you more confused. A hint that would have helped was a reminder to wiggle that device! In the real escape rooms I have played, when you use a hint they would stay with you, helping you until you solved that part you were stuck on. That said, I think this is a great idea at a convention. I hope they bring it back next year with some tweaking. Is GeekyCon my favorite con? No, but we did have fun and I will buy a day ticket again for next year. Let us know in the comments if you went this year or are planning to attend in the future.